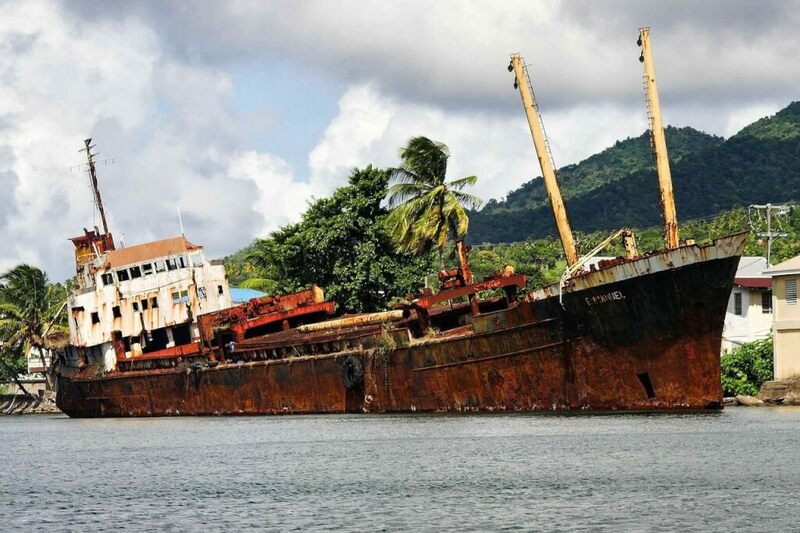 Due to the environment in which they operate, ships are among the structures most exposed to environmental corrosion. The sea water is a very corrosive environment because the salt present in it makes it a very good conductor of electricity. It creates a lot of free ions which accelerate oxidation of iron (mild steel) which ships are made of. This oxidation creates what we know as rust. There are various methods of protecting the ship hull and other areas from corrosion. The selected method depends on the area to be protected, its shape and its environment. 2.1 What is Cathodic Protection? Cathodic protection is a mechanism which is employed to protect the ship’s surface from corrosion. As the name suggests, it has something to do with ‘Cathode’. What is a Cathode, and how does it protect a ship from getting corroded? For this we will have to get a little bit into the mechanism of corrosion. How does corrosion take place in ships? Ships are made of steel; whose main component is iron. Iron is an electrochemically positive element, i.e., it has a tendency to give up electrons to become a free ion. Sea water is composed of oxygen and hydrogen, and it produces electrochemically negative hydroxyl ions which can accept the electrons given by Iron. This way the Iron ions combine with the hydroxyl ions of water to form Iron Hydroxide. This is called the oxidization of Iron, and this oxide is what we call as the brown color rust. The galvanic series is a series which rates metals based on how readily they give up electrons to become ions. This is measured in terms of ‘Electrode Potential’. The table below shows the rating of different metals. The ones with more negative electrode potential are more likely to give up electrons and get corroded. Looking at the table above gives us an idea. The elements like Aluminium, Zinc and Magnesium are higher up than Steel on the scale (i.e., more negative). This means they are more ready to give up electrons and get corroded compared to Steel. 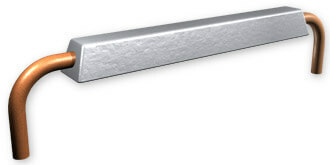 What if we introduce a Zinc bar and place it on the steel? The Zinc will get corroded first instead of the Steel, protecting the Steel, right? This is the entire concept of Cathodic protection. When such an arrangement is used, the item which is being protected (i.e., ship’s steel) is called Cathode, and the one which sacrifices itself to protect the cathode is called Anode. Anodes are more electrochemically negative, and they save the Steel by getting corroded first. The Steel is converted to a ‘Cathode’, and so this method of protecting the Steel from corrosion is called ‘Cathodic Protection’. Now let’s move on to learn about these anodes and how they are used for Cathodic Protection. Till now we know that we can use Zinc, Aluminium and Magnesium for becoming sacrificial anodes. Generally, for ships, Aluminium and Zinc are used. How do these anodes look? Where do we place them on the ship? How many of them are needed? The basic idea of using sacrificial anodes is to use a metal like Zinc/Aluminium and create its contact with the surface to be protected. The simplest picture which comes to mind is simply using a flat bar of the metal and fix it to the surface to be protected. This is actually the method commonly used to protect the outer ship’s hull. We will discuss now the classification of anodes. Anodes can be classified based on their shape, size, material, mounting method and method of securing to the surface to be protected. 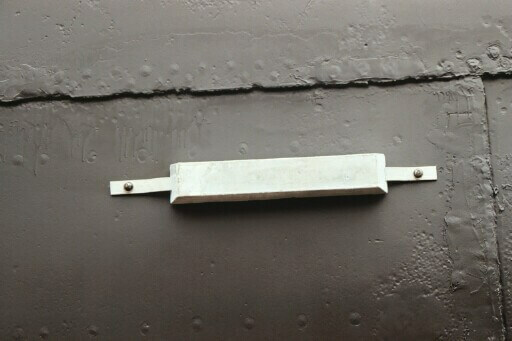 For example, flat anodes are used mostly for flat, large surfaces like the ship’s hull. Tear-drop anodes are used in high speed boats where streamlining of water is important as flat anodes will increase the boat’s resistance. Bracelet anodes are used for pipelines and propeller shaft, while tubular anodes are used for cables. There are no fixed rules here though, and the choice depends on the availability, cost and flexibility in design. For example, cylindrical anodes can also be used to protect pipelines, and it is not necessary to use bracelet anodes if they are costlier. Usually for marine applications, Zinc or Aluminium anodes are deployed. Zinc has been traditionally used for corrosion protection, though Aluminium is now widely used. The two properties which measure performance of an anode are listed below. Closed Circuit Potential – the first parameter, Closed Circuit Potential signifies the ease with which the anode will be corroded. The more negative the value, the more readily the anode will get corroded. Generally, a potential of less than -0.08 Volts is required for cathodic protection of shipbuilding steel to be effective. Electrochemical Capacity (in Amp-hr/kg) – The second parameter, the Electrochemical Capacity, signifies the rate at which the anode material will be consumed. We can see from the above table that Aluminium has a higher closed circuit potential – so it will more readily start working compared to Zinc. It also has higher Electro-chemical capacity compared to Zinc, and will be longer lasting for the same anode size. Further, in fresh water application, Zinc tends to develop a calcareous coating on the anode surface, which prevents their effective working. However, Zinc anodes have sometimes been found more reliable in environments with low oxygen, e.g., marine sediments or areas with high bacterial activity. Thus, while Aluminium is the more efficient one, Zinc may be more effective in some cases. Further, Aluminium anodes, if falling from a height on oxidized steel, can create sparks. Thus they are nor recommended to be used inside cargo tanks of tankers. The maximum height above tank bottom which they must be placed is 28/W meters, where W is the weight of the anode in kgs. Hence, the selection of the material depends on the type of environment it is going to be used, and should be carefully carried out. The next important consideration for installation of anodes is the mounting method, i.e., the configuration of the tubular insert, and the positioning of the anode vis-à-vis the surface to be protected. Flush mounted anodes – in this type of anode, the anode material (Aluminium or Zinc) is in direct contact with the surface to be protected. The insert is generally a flat bar which can be welded or bolted to the surface. 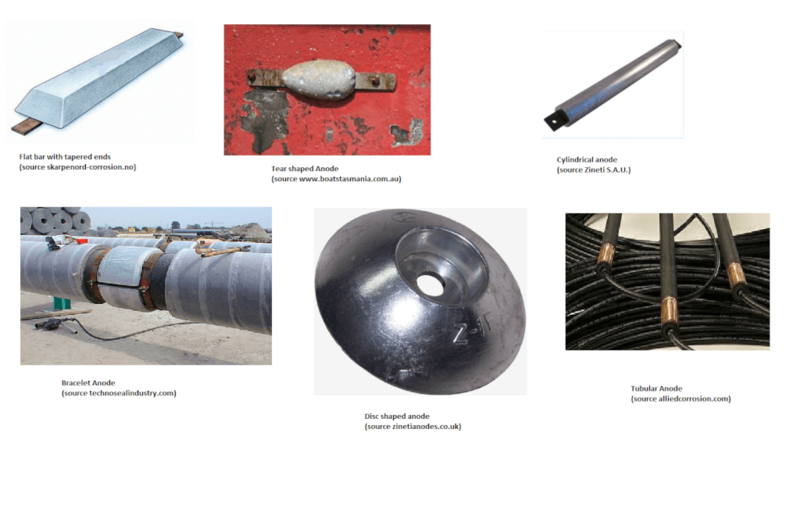 Slender stand-off anodes – In these types of anodes, the anode material is not in direct contact with the surface to be protected, and there is a gap (hence the name stand-off). The insert is generally a tubular one which can be welded or bolted to the surface. One question arises, why do we need stand-off anodes, and why not flush anodes everywhere? What is the benefit of stand-off design? The benefit of a stand-off design is that it is a more compact design, and the anode material is better utilized in a stand-off design. This is quantified by a parameter called ‘anode utilization factor’. This is the fraction of the anode material which is actually utilized over the lifetime of the anode. For flush anodes, this is around 80%, while for stand-off anodes it is 85 to 90%. Thus, stand-off anodes are better utilized over their lifetime. Further, in case of flush anodes, due to constant contact between the anode material and the surface, the surface may suffer from embrittlement caused by deposition of ions from the anode material to the cathode (the protected surface). That said, stand-off anodes protrude from the surface on which they are installed. 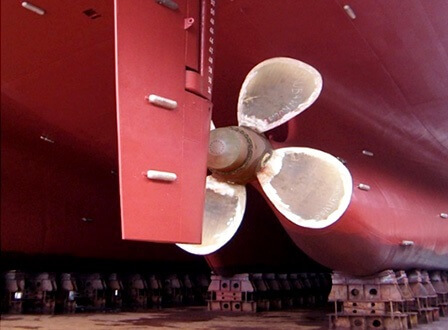 When used on external hull of a vessel, these affect the streamlined shape of the vessel, and lead to increased drag and higher powering requirements. In comparison, flush anodes are closer and more compliant to the vessel’s geometric shape and have lower effect on resistance. Thus, flush anodes are usually preferred on outer hull due to their low drag properties. Both Flush mounted and slender stand-off anodes are further classified into Short and Long, depending on their ratio of length to width. The length affects the resistivity of the anode and thus its current capacity. Welding ensures the closest electrical contact between the anode and surface to be protected, thus ensuring good conductivity between anode and the surface through the insert material. However, due to issues of accessibility, some locations (e.g., stringers, girders etc.) may not be conducive to welding, and bolting or bracket installations may be preferred. Additionally, if the anodes have to be replaced relatively frequently, then bolted ones are relatively easier to replace compared to welded ones. Anodes can also be bolted to small studs or brackets which in turn are welded to the hull. In this section, we will see how we can calculate the number of anodes needed for protecting a surface. For this calculation, we will be following the DNV-RP-B-401, which details the procedure. Before we get into actual formulas, it will be pertinent to understand what the anode is doing and how it is protecting the surface. Some concepts are presented below. The anode, when connected to a surface, sets up an electrical circuit and current flows from cathode to the anode. 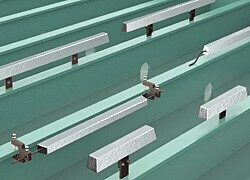 Each surface to be protected will need a minimum amount of current to flow for adequate protection. This is called the ‘current demand’ of the surface to be protected. The current demand of the protection surface also varies during its lifetime. Initially, when anodes are installed, then the surface metal is bare and fresh. The initial current demand will be the amount of current required to effect polarization of the bare metal surface in a short time-frame for protection to begin. This is called the initial current demand. However, overtime, the surface develops calcareous deposits (due to cathodic protection), and also marine growth. These act as a deterrent to corrosion and thus reduce the current demand. When the anodes are close to depletion, then the current required to initiate protection in a short time-frame is called the final current demand. Once Cathodic Protection is in action over a long time, then the Cathode potential becomes more negative, and the Cathodic Protection (CP) system is said to have reached a steady-state. This is called cathodic polarization, and it reduces the current demand over the operational life of the structure. The current demand during the steady state is called the mean current demand. Here we need to note the difference between the initial/final and mean current demands. While initial/final current demands are the currents required to initiate Cathodic Protection, the mean current demand is the current required for the Cathodic Protection to keep operating during the lifetime of the anode. 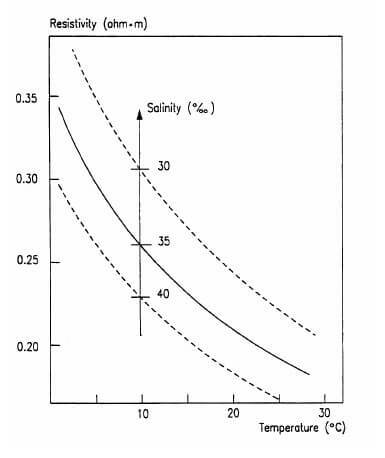 The mean current demand is around 50% of initial/final current demands, since the Cathodic Polarization leads to more negative cathodic potential, reducing the current needed for CP to keep working. The second important concept here is the coating breakdown factor. When a surface is coated with an electrically insulating coating (epoxy, polyurethane or vinyl based), then this provides additional protection against corrosion and reduces the current demand. The factor by which the coating reduces the current demand of a structure is called coating breakdown factor. Its value lies between 0 and 1. A value of 0 means that the coating is 100% insulating, and a value of 1 means that the coating provides no current reduction. The extent of reduction in current demand is dependent on the type of coating and the water depth at which the structure is installed. Category II One or more layers of marine paint coating (epoxy, polyurethane or vinyl based), total nominal DFT min. 250 μm. Category III Two or more layers of marine paint coating (epoxy, polyurethane or vinyl based), total nominal DFT min. 350 μm. The coating breakdown factor is different for initial, final and mean phases (since ‘t’ is different for each), and is to be calculated separately for each stage. At this stage, we know what current demand of the surface to be protected is, and how we calculate this current demand. Let’s now look into the critical properties of anode which help us in the calculation of number of anodes needed. From the above formulae, we can see that the resistance depends on the anode dimensions. Now, as the anode is consumed by usage, its mass depletes, and the final dimensions of a completely used anode will be smaller compared to the time it was installed new. Thus, the resistance in the initial and final conditions of the anode will be different. These properties have been discussed before. Electrochemical capacity signifies the rate at which the anode material will be consumed. It is measured in Ampere-hr/kg. Basically, it measures the amount of material which will be consumed to produce a one Ampere current for 1 hr. Closed circuit potential is the potential at which the anode will be when connected in a circuit to the cathode. Basically, the Steel surface is at a potential of -0.8 V while the anode is at a more negative potential. The Electrochemical capacities and closed circuit potentials of Aluminium and Zinc anodes can be taken from DNV-RP-B401 and presented below. Now we will discuss a property called the current ‘capacity’ of the anode. This is different from the current output of the anode. Current capacity is the amount of current which the anode can produce over its lifetime of usage. Thus, it depends on the amount of material the anode carries, i.e., its weight. We know by now that the net anode mass usable for cathodic protection is determined by the anode utilization factor. Now, if the electrochemical capacity of the anode is designated as Ԑ, then Ԑ amperes of current per hour will be generated by per kg mass of the anode. This is called the current capacity of the anode, and denotes the amount of current per hour it can produce over its lifetime. Now that we are through with the concepts above, we can get into the actual calculation of number of anodes. Understanding the calculation is relatively simple. Let the minimum number of anodes required be N.
ma can be obtained from the anode’s catalog, while u (anode utilization factor) and Ԑ (electrochemical potential) can be obtained from the DNV-RP-B401. Step 7 – Calculate the total required current output of anodes. The required mass of anodes should be sufficient to supply the mean current demand over the design life of the anodes. The mean current demand of the structure is Icm Amperes. Step 8 – Calculate the total required anodes to meet required mean current demand. Thus, we see that the total number of anodes should be able to satisfy the equations 1, 2 and 3 simultaneously. Based on above guidelines, we can calculate the minimum number of anodes required, N.
In this section, we summarize all the steps which will be needed for you to plan the cathodic protection of your structure using sacrificial anodes. Zinc and Aluminium are widely used. Can be slender stand-off, flush mounted, or bracelet etc. Slender stand-off anodes have better utilization factor compared to flush mounted. Flush mounted anodes may be more preferable for outer hull due to relatively better drag properties. Calculate the initial, final and mean current demands from the current densities and coating breakdown factors. There are other important topics related to anodes, viz. Replacement of anodes – when and how? Considering the vastness of the material to be covered in these topics, we will cover them in later articles. PS: www.thenavalarch.com has its own spreadsheet app for calculating the number of anodes needed for protection. It is based fully on DNV-RP-B401. You may wish to check it out below.